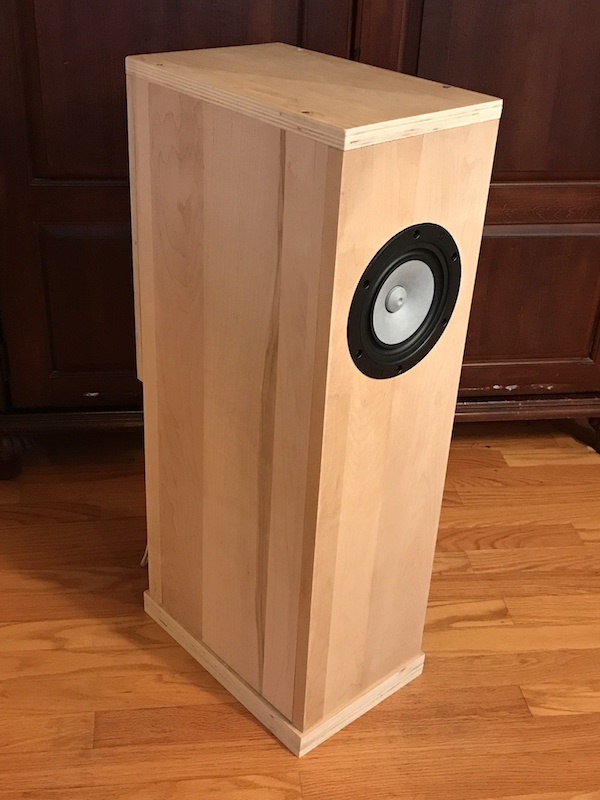 Hi, I am determining the material for making a set of these speakers, I have access to 3/4 solid maple and cherry, plained and glued - straight. If I used this for the sides front and back and then 1/2" either birch ply or MDF, does anyone see a problem in that affecting the sound? In looking at some pictures of some of the builds, it looks like people are using 3/4 for the outside panels and 1/2 in for the interior partitions. Thanks for your help! Andy, I think that you are right on track. The outside panels of this cabinet can pretty much be as thick as you want, but not thinner than 1/2". The fact that you have Solid maple, suggests that it would serve just fine for the baffle, as used in pianos. The cherry may be better served for the sides, as it's density might a bit less than the hard/tiger/spalted/curly maple. As you might have already guessed, each wood has it's own set of qualities. I suspect that you are a wood worker and have that appreciation already. Thanks for your comment! I have the hots to saw some wood.. I think I will be able to make these and will let you know how they come out and post photos. The wood is from old table tops, Ethan Allen, so very nice American cherry and maple. And it's free. OK, another question! If I use 3/4 material on the sides, the drawing says the material is 1/2", that would make the width of the interior per the drawing 7" since they specify the exterior width only, being 8"
. If I have 3/4 material, should I maintain the 7" interior and make the overall width 7 +3/4 +3/4 = 8.5? I hope that makes sense. Seems like the interior volume has been carefully calculated, guessing. Thanks! The easy way to do this, is to cut all of your 1/2" MDF Interior pieces to 7" width first. I just ran a bunch of MDF through at the same time, making my widths exactly the same. THEN I cut the rough lengths for each piece (X2, one for each speaker) and labelled them. Finally, I cut the correct angles for each piece. Yes, you are correct about the dimensions too. That is, Nothing changes on the inside measurements, but The Completed outside measurements will be wider just because of the extra thickness of the panels. Let me know if this makes the right sense to you. Of course, you are obligated to show the results of your efforts in this venture, especially since you are using decent materials;) Will you be using the Alpair 10P drivers, or another driver instead? Personally, I find the 10P to be a great choice, where I will adjust the treble for my wretched hearing. Hi, I am planning to use the Alpair 10P drivers. Open to other suggestions, however, I believe I saw a post on this site where Steve put most of the available choices through testing and this one was deemed the best. I am looking for pictures of completed speakers if anyone can send links, that would be great. Thanks. Why not scale up the plans and make some DNA2's? This isn't complete, but it gets the idea across. ZOB in the rear. DNA in front. The room arrangement was just for the breaking in of the drivers. Thanks for sharing the picture. I have everything cut and am ready to assemble them. I've used accusta stuff, fiberglass insulation, and the stuffing out of those stupid pillows that my wife puts on the couch. Some people line the walls with thick felt, I've thought about using old flannel shirt material. I seem to remember shredded up phone books also. I used old felt moving blankets. They worked just fine. On the back wall of the enclosure, I had cork sheeting that I attached, just to mix things up. I used a layer of contact cement trhoughout the chamber for attaching these things to. All worked out fine. Donnie, you tempt me with the idea of the larger speakers, I need to keep my head on though, and complete these first. Next set, I want to cut the pieces on a cnc router. I don't really have room for the larger speakers, but I won't let practical problems stop me. Do you know if there are plans out there for the larger DNA2 speakers? In regard to your question, many of us are waiting for the plans to become available for the DNA2 cabinets. The fact that you have access to a CNC router should make for a perfect fit. I would think that a person could take the current DNA print and "expand" upon it. 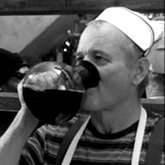 Roughly multiply everything by 1.467 and Bob's your Uncle. Good to know! 1.467.. I will get these done ASAP and post pictures. Well, I pretty much finished the DNA speaker project. 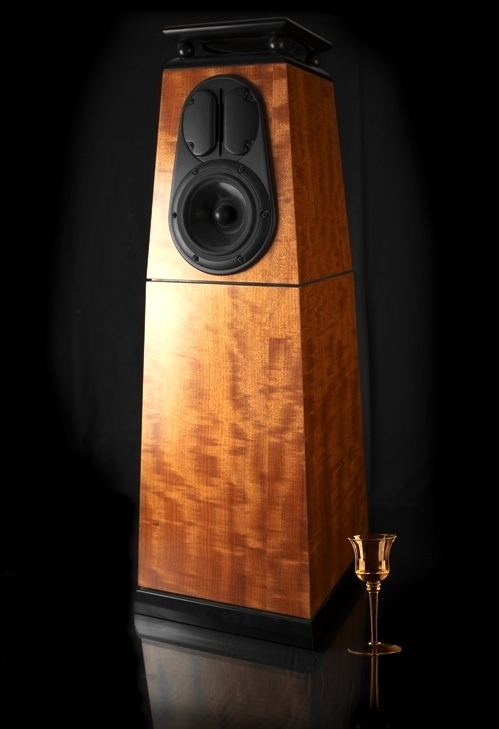 Thank you, Steve D. and all, for making the plans and accumulated knowledge about these speaker designs available. I really appreciate the work and experience that is behind these. No way I would have gotten to these drivers or cabinet design any other way. I am happy with the sound. I used the Mark Audio Alpair 10P drivers and really enjoy them. Very nice in the mids and highs and plenty of lower end too. The sound really spreads out throughout the room. Very lively. I learned plenty doing these speakers, enough that I will probably want to build a bigger set. Using maple for the sides and front probably is not a good idea. Stick with plywood or mdf. The wood I used has lived in my unheated garage for many years, and when it got into the house, it managed to split as the humidity came down. So note to self, let your wood acclimate before using it. I had to use epoxy on a few cracks! Very impressive! They turned out looking great. I am envious of those with work working skills. It seems as though you are a cut above your average DIY guy when it comes to handling wood and saws. Anyway, I'm sure they sound as good as they look. Steve knows his way around prudent speaker design so there is no doubt they perform as expected. I didn't mind building the DNA. It got me in shape for the DNA2 build. I gave these speakers to my son today. I think that they actually sound better at his place than mine. Even took them to a large room in a coffee shop on Saturday. They sounded good, but that size room needs the DNA2. I'm tho one who came up with the 1.467, so i wouldn't take it as gospel. I got it by multiplying the numbers out until they matched the finished dimensions of the DNA 2's. The numbers should be pretty close. Make sure that you read the comments that Steve made about the throat being longer and put that into consideration. I believe I used 1.4 as a multiplier. Because of things I did to the outside of the cabinet, scaling from the outside dimensions won't work. I started with the same 1/2" at the very beginning, then I scaled the port, or horn flare, so it was accurate, which takes away some of the space that the driver occupies. I would look at the DM945's for tweeter placement. I'll dig around and find out what capacitor to put on the tweeter. I truly love the Silver Flute driver, it sounds real nice.